A 59-year-old woman presented to our hospital with a 6-month history of nausea, weight loss, and abdominal distension. Physical examination revealed abdominal distension without tenderness, and edema, numbness, and multiple peripheral neuropathy in the limbs. Blood test results showed anemia, hypoproteinemia, and hypoalbuminemia. Immunoelectrophoresis detected kappa-type Bence-Jones protein in both the serum and urine. Bone marrow examination did not reveal an increase of plasma cells. Computed tomography showed intestinal distension and retention of intestinal contents. No obstructive intestinal lesions were observed. 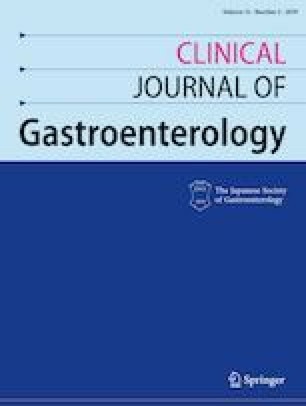 Lower gastrointestinal endoscopy showed a decrease in the vascular visibility of the rectal mucosa. Histological findings showed amyloid deposition, which was positive for amyloid light-chain (AL) κ. Thus, she was diagnosed with chronic intestinal pseudo-obstruction (CIPO) due to gastrointestinal and neurological involvement of AL amyloidosis. Her abdominal symptoms were gradually improved by the insertion of an ileus tube and medication. Although we recommended chemotherapy for stopping her disease progression, she did not want to receive it. She died 1 year later because of her pneumonia. We should keep in mind that amyloidosis is an important cause of CIPO. Histopathological examination by endoscopic biopsy is required for exact diagnosis and appropriate treatment for CIPO due to amyloidosis. Tomoya Iida, Daisuke Hirayama, Gota Sudo, Kei Mitsuhashi, Hisayoshi Igarashi, Kentaro Yamashita, Hiroo Yamano, and Hiroshi Nakase declare that they have no conflict of interest. Informed consent was obtained from this patient for being described in this case report.